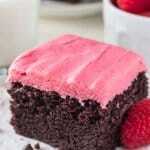 Creamy raspberry frosting sandwiched between two soft & fudgy chocolate cookies – the perfect recipe for Valentine’s! I’m in love with Valentine’s day. But Valentine’s day has captured my heart and I can’t stop my obsession with festive baking. Red Velvet, White Chocolate & now these delicious Chocolate Sandwich Cookies with Raspberry Cream Cheese Frosting. These cookies start with fudgy, chewy chocolate cookies. Then we’re shmooshing them together with raspberry cream cheese frosting made from fresh raspberries. The combo of chocolate and raspberries is dynamite already, but the cream cheese frosting ensures that your sandwiches aren’t too sweet. The rich chocolate flavor of the cookies and the tangy frosting will remind you of cream cheese brownies with a swirl of delicious raspberries. It’s actually perfection. The cookie recipe is adapted from my Soft-Batch Double Chocolate Cookies. They’re deeply chocolate-y, and super soft. You’re going to use melted butter in this recipe to keep them extra chewy, and we’re adding just a touch more flour so they’re strong enough for sandwiching purposes. After making the dough, you’ll form it into balls of about 1 to 1.5 tablespoons and then flatten each ball slightly so that the top is flat. I definitely recommend using a cookie scoop here so that your cookies are all uniform size for easier sandwich making. Raspberries and deliciously smooth cream cheese make all the magic happen in this frosting. Now because we’re using real fruit – there’s a few extra steps. But’s your Valentine (and yourself of course ) are totally worth it. First you’ll boil up the raspberries in a saucepan to make a a thick sauce. This is to remove excess water from the raspberries – otherwise your frosting will be thin and … well…. watery. You’ll then pulse the sauce briefly in a blender or food processor, and push it through a sieve to remove the seeds. You’ll end up with a very thick raspberry sauce. After this, going about making the frosting is pretty straight forward. Beat together cream cheese & butter, add in raspberry sauce (once it’s completely cooled to room temperature), and beat in the icing sugar bit by bit until you reach the perfect consistency. Then – sandwich away!!!! The frosting recipe will likely make a little too much than what you’ll need, but I don’t think anyone will be complaining. With how delicious these cookies are – you’re going to have one very lucky Valentine. 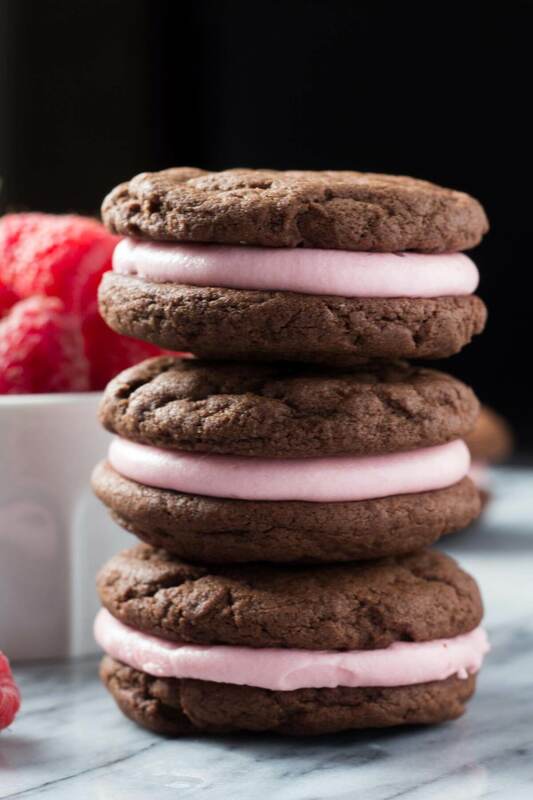 Creamy raspberry frosting sandwiched between two soft & fudgy chocolate cookies. These sandwich cookies are the perfect recipe for Valentine's! Preheat the oven to 350F degrees and line cookie sheets with parchment paper or silicone baking mats. In a large bowl using a stand or hand-held electric mixer, cream together the melted butter and sugars on medium-low speed. Once no sugar lumps remain, add in the egg and vanilla and continue mixing until combined. In a separate medium-sized bowl, whisk together the flour, cocoa, baking soda and salt. Add the flour mixture into the butter mixture about 1/2 at a time while mixing on low speed. Scrape down the sides of the bowl as necessary. The dough with be thick and very sticky. Using a cookie scoop, form the dough into balls of about 1 to 1.5 tablespoons in size, depending on your cookie scoop. I got about 24 in total. Place the dough balls 2 inches apart on the lined cookie trays, and flatten the tops of each cookie. Bake the cookies for 6-8 minutes - the tops should look almost set when you remove them from the oven. Allow the cookies to cool on their baking tray for at least 10 minutes, then transfer to a wire rack to continue cooling. To make the icing, first add the raspberries and tablespoon of granulated sugar to a small saucepan. On the burner over medium heat, allow the berries to melt and then boil while stirring occasionally. You want to boil the mixture down to reduce the water and it looks like a thick jam or compote consistency. I allowed mine to boil while stirring occasionally for about 10 minutes. After - your mixture should reduce to about 1/4 cup to 1/3 cup. Allow to cool slightly, then add to a food processor or blender and pulse for about 10 seconds - you don't want to pulse the seeds into smaller pieces. Then strain the mixture using a sieve to remove the seeds. You should end up with about 2-3 tablespoons of a very thick raspberry sauce with no seeds. Allow to cool completely (this is 100% mandatory). Then in a large bowl using a stand or hand-held electric mixer, beat the cream cheese and butter together until smooth. Add in 1 tablespoon of the raspberry mixture, followed by adding the powdered sugar about 1/2 cup at a time and mixing on low speed. After you've added 1 full cup of powdered sugar, add in 1 more tablespoon of the raspberry mixture. Continue mixing on low speed and add in the rest of the powdered sugar about 1/2 cup at a time until you reach your desired level of sweetness. The frosting should be creamy and smooth. It will be thinner than peanut butter in consistency, and not thick enough to pipe using a detailed piping tip. Frost the bottom of one cookie with 1 to 2 tablespoons of frosting and place a second cookie of equal size on top. The recipe should make about 11-14 sandwiches total, depending on the size of your cookie scoop.